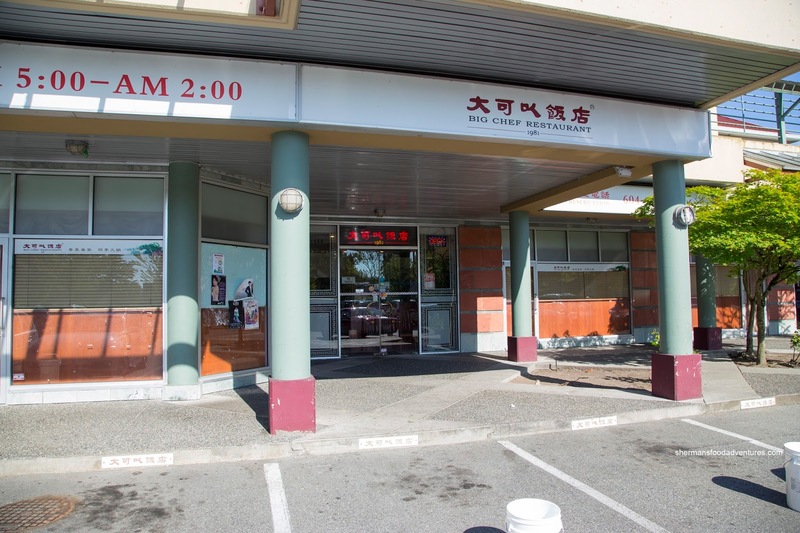 Sometimes, I take for granted how many great Chinese restaurants there are in Richmond. So much so, I stop looking for new ones to try. In fact, with so many plazas and strip malls, many of them can be easily overlooked. On the other hand, it could very well be my aversion to the automobile equivalent of musical chairs in the many chaotic parking lots. However, with an invite to try out Big Chef courtesy of the Chinese Restaurant Awards, I guess it was time to play bumper cars in the parking lot (well, at least not the spots in front due to the pails). 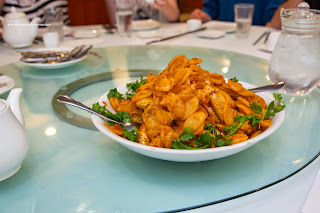 To begin, we were served a monstrous plate of Pan Fried Dungenss Crab with Salted Egg Yolk and sliced rice cake. 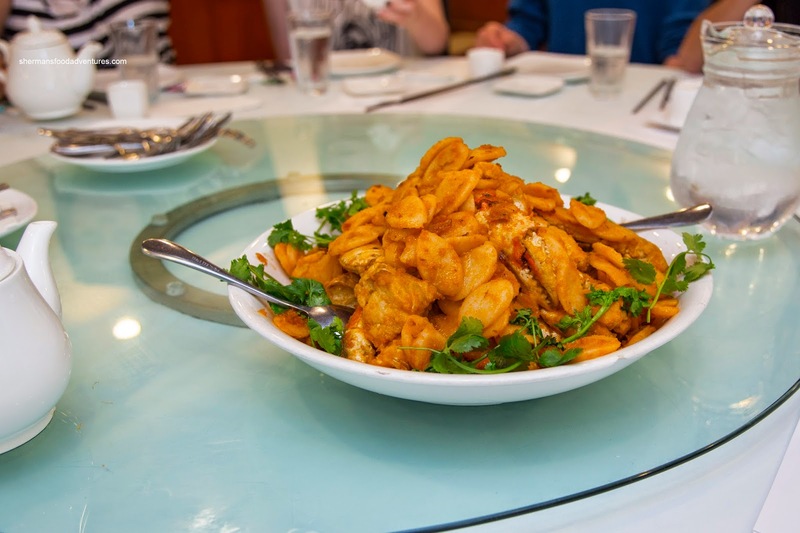 Unlike the wetter version found at Ken's Chinese, this one featured a light dusting of fully cooked and mostly dry salted egg yolk. Hence, it was more aromatic and impactful. I liked how it was muted in terms of the saltiness which meant the crab meat was able to be heard. Next, we had a much lighter dish in the Sauteed Broccoli with garlic. They weren't shy with the minced garlic as it was obvious to the eye and taste. 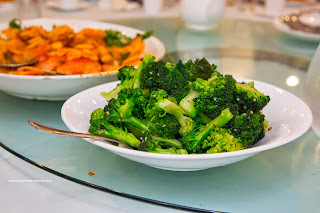 This dish demonstrated appropriate wok heat where there was no moisture at the bottom of the plate while the broccoli was still crunchy, yet cooked all-the-way-through. 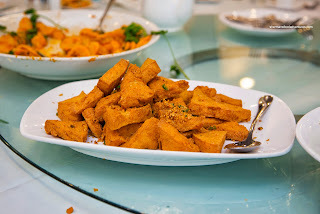 Onto another meatless dish was the Deep Fried Salt & Pepper Tofu which were tossed in a good amount of fried garlic, chilis, salt and pepper. Hence, there was ample impact while not being over-seasoned. Texturally, the tofu triangles were firmly crispy on the outside while soft and moist on the inside. 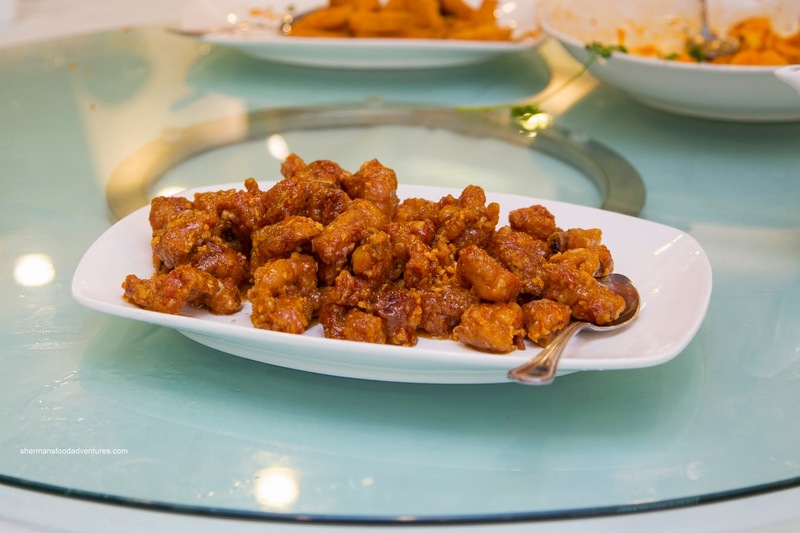 With just enough sauce clinging onto each piece, the Honey Garlic Spareribs were on point. Despite the crisp exterior, the meat underneath had a juicy rebound texture. Furthermore, the rib portions were meaty, easy on the fat and cartilage. We found the sauce to be on the sweeter side (due to the plethora of honey) with plenty of garlic notes. 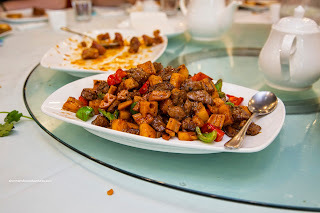 Exhibiting a textbook stir-fry, the Pan Fried Hotos Rhizome and Mushrooms with Beef Tenderloin was the beneficiary of high wok heat. In addition to the caramelization of the ingredients, the beef was seared nicely with a slight smokiness. On top of that, the veggies retained both their vibrant colour and texture. The addition of pineapple balanced off the ample soy in the dish. Onto our obligatory sweet & sour dish, but not the usual pork version. 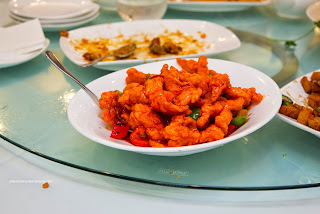 Rather, we had the Sweet & Sour Sole. These were a good size and fried up until firmly crunchy. There may have been a touch too much batter as the fish kind of got lost. Despite this, the nicely balanced sauce clung onto each piece with the right amount viscosity. 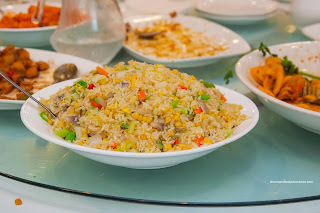 Lastly, we had the Vegetarian Fried Rice which contained almost as much vegetables as rice (yes, we had a vegetarian at our table, hence the 3 veggie dishes). Well, despite the absence of meat, the rice was still hearty due to the ingredients (including mushroom). Chewy and well-seasoned, the rice was not affected by the amount of veggies due to the high wok heat once again. 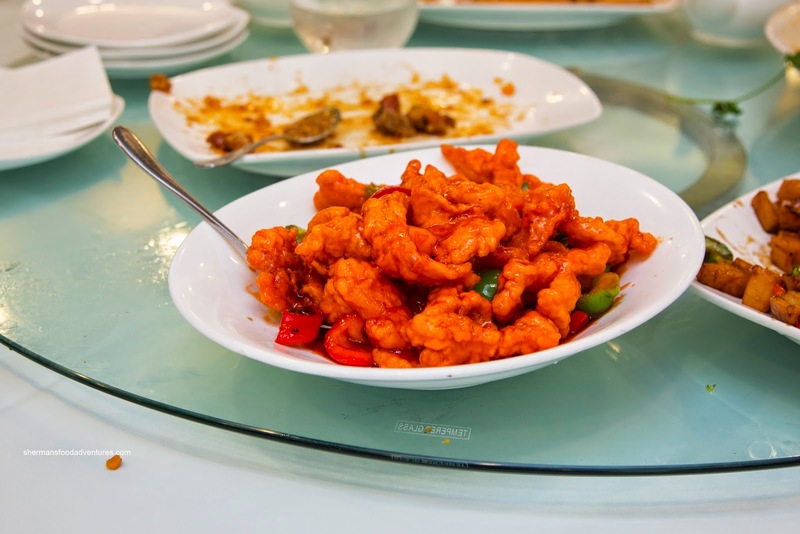 For the dishes we sampled, it was pretty clear that they didn't have any problems with proper wok heat as everything had a certain dryness and caramelization. Maybe I'll be back to try their late night (as they are open until 2:00am). By then, hopefully the parking lot will be less busy. What is "Hotos Rhizome" ?? ?